In the wake of a spectacular senior season, senior quarterback Preston Heard captured major post-season honors as the Houston Private School Offensive Player of the Year. The award was given by the Touchdown Club of Houston at its fourth annual Private High School Awards Dinner. 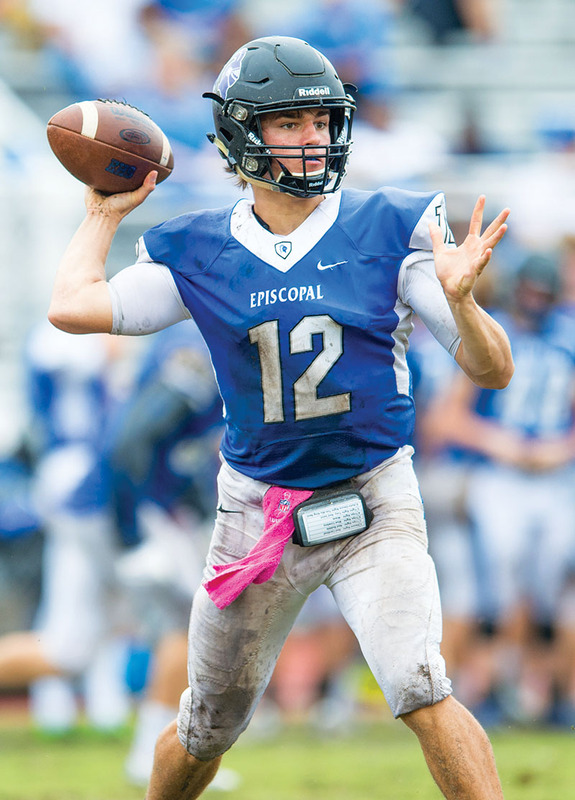 “Preston is the ultimate gamer,” said Episcopal head football coach Steve Leisz. “When the game is on the line, you want the ball in Preston’s hands. He’s just a really smart kid and incredible leader.” Another big honor for Episcopal went to Gio Pancotti, who shared the Houston Lineman of the Year award with St. Thomas Eagles senior Charlie Vatterott. Pancotti, who will play college football at Texas Tech, played in the recent Offense-Defense All-American Bowl on ESPN. The Mustangs are especially strong at the guard position with the dynamic duo of twin sisters Kelsey and Courtney Slattery. “Kelsey is a great defender who does whatever we need on the court,” said Coach Larry. “She’s a senior captain and tremendous leader.” Meanwhile, twin sister Courtney has established herself as an outstanding shooter, even breaking a school record by connecting on eight 3-point shots in one game. The Mustangs offense is also ignited by sophomore point guard Grace Yochum. “Grace makes everyone else’s job easier when she’s on the court,” said Coach Larry. 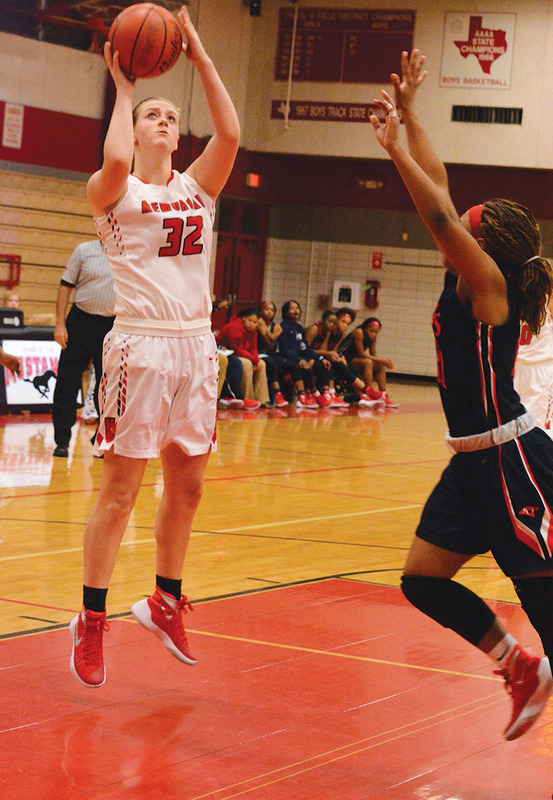 “She really makes everything go for us.” Down low, the Mustangs are led by senior post player Amanda McCloskey, who Coach Larry says is the Mustangs’ top defender and rebounder. “We’ve been in the playoffs for 19 straight years, but our last playoff win was back in 2005. Hopefully, this is the group that’ll get us that post-season victory,” added the coach. With key victories over Lamar and Westside to open up district play, the Bellaire Cardinals boys basketball team looked to be well on its way to securing a 14th consecutive playoff berth, with seven district titles along the way. 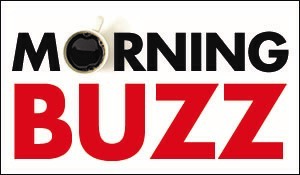 “We have a rock-solid program,” said Bruce Glover, who has coached the Cardinals to all 13 of those playoff berths. This year’s team is led by a talented trio of juniors, including guard Maxwell Evans, who averages 20 points, five rebounds and five assists a game. Also, six-foot-six post player Jaden Pevy, who was a standout defensive end in football, is contributing 15 points and 10 rebounds a game. Isaac Allen is averaging 10 points and three assists a night for the Cardinals.